Product prices and availability are accurate as of 2019-04-21 18:12:51 BST and are subject to change. Any price and availability information displayed on http://www.amazon.com/ at the time of purchase will apply to the purchase of this product. 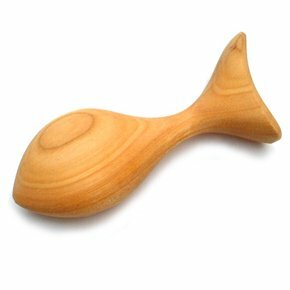 Wooden Fish shaped rattle and teether. 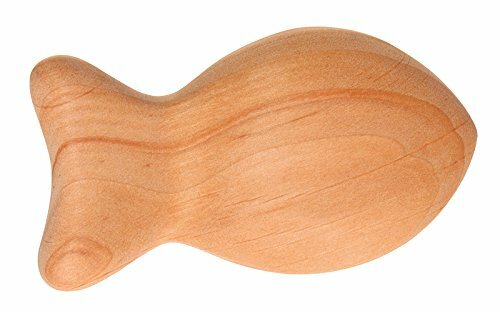 Traditionaly wooden teethers have proven to be beneficial and great at aiding teething symptons so we was pleased to come across such a high quality well made wooden teether. Fish shaped, makes it interesting and easy to grasp and hold for baby, Also this is made to US safety standards so no need to worry about toxins and the like. The Rattle part of this set is again well made and works as a toy for baby, with some nice thick sounding noises coming from the rattle. 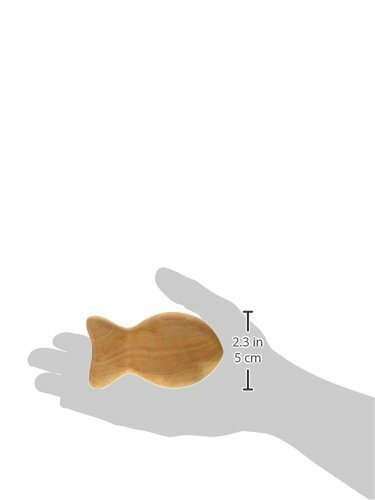 The teether is made from a high quality made wood, with the fish shape making it easy for little baby hands to touch, feels and work there hands around. All in all a great quality teether and rattle that would be sure to please your new baby. Smooth, rounded edges are comfortable and safe for baby. Finished with food grade, non-toxic oil. Filled with tiny semi-precious stones that make a gentle a very gentle noise. Specially shaped to be easy to grasp. Handmade in Germany. 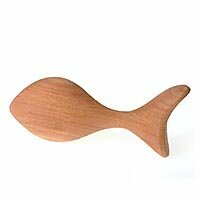 The beautifully-made wooden Fish Rattle by Grimm's Spiel & Holz is soothingly simple. 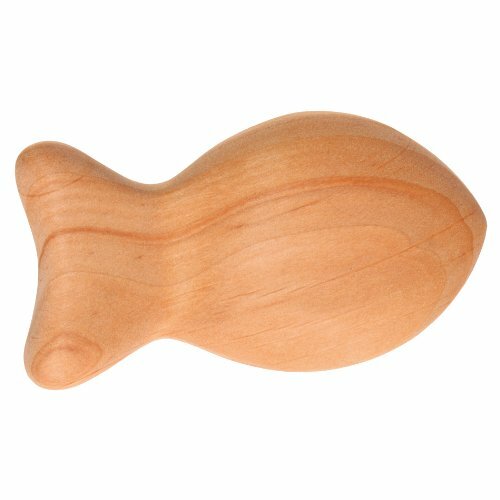 If you're looking for a unique rattle that's easy for little hands to grasp, this one's quite a catch. It is filled with tiny, semi-precious stones to make a gentle rattling sound. It can be safely used by babies as a shaker, grasper, and even a teething toy. Suitable for Ages 3 months+. All Grimm's Spiel & Holz toys are made from sustainable alder, lime, maple and cherry timbers and treated with pure vegetable oil. Grimm's toys use green electricity sources, and minimal packaging. Wood is an ideal material for a baby's first sensory impressions, as it has many different sense experiences. Bacteria cannot breed on wood. This is especially true for non-varnished wood. Designed by Grimm's, who have been making natural wooden toys since 1978. Grimm's Spiel & Holz designs and develops long-lasting toys, whose simple and reduced shape, together with its beautiful coloring and inviting surface feel can be used for all ages - Products that want to be touched, again and again, and which communicate their credo: Joy through color! The natural oil used is water based and in accordance with EN 71, are harmless to your health and suitable for children age 3 months and up. Grimm's is committed to helping children discover and develop their own creativity. CPSIA compliant. Parents love GRIMM'S Toys because designs by this German company advance creativity, leaving room for independent play through simple and reduced shapes. GRIMM'S Toys support holistic sensory perception & development. GRIMM'S Toys stimulate a harmonic color sense and are long-lasting and is ageless in design. GRIMM'S Toys have a special surface feel, that children want to touch, feel and experience with all their senses.